***Just one more note about the recipe at the bottom. If you want to skip making it pretty, half the recipe and pour icing on a 9 x 13 sheet cake. The grass is greener on the other side, especially behind an Instagram filter. When I worked at my oh-so-important job in DC, I used to long for the simple life: a family of my own, a smaller town as quaint as Stars Hollow, complicated tax returns and hectic holidays with in-laws. I envied the images on social media of my friends with a spouse and kids and believed that they had a perfectly charmed life; their smiling babies and color coordinated outfits, posed in front of a rusty, old barn. And those status updates. It must be so nice to have a husband earning an income and staying home as a mom; free to lounge around in pajamas, eat cookie dough, read, watch TV and play with those adorable, sweet kids. Their lives must be so happy, easy and complete! It was rainy and cloudy when we arrived for our family photo shoot last fall. It took me weeks to figure out how to coordinate the outfits of my husband, toddler, baby and me. I mean, does anything fit me anymore? I guess I needed to buy something that didn’t include yoga pants and a baggy T-shirt. And my 5-month-old son’s legs were too long now to wear the matching outfit I previously picked out for him. Will my toddler even smile without a kitty cat or a piece of cheese dangling in front of her face? Not to mention, it took an hour and at least 200 pictures to get the perfect picture. I know mom-life is not always the filtered, edited images projected on social media. However, I do have an amazing husband and kids and we live in a small town as quaint as Stars Hollow, but it is far from glamorous. But being single with free time, personal income and a passport to the world was far from glamorous as well. Raising little people certainly is one of the most mesmerizing experiences. The magnitude of a tiny life floors me on a daily basis – their smiles, their discoveries, their new abilities, their energy and their love. It is sweet and pure and real. And I know I will look back on this hard time as possibly one of the greatest times in my life. Cooking can be such a chore to some people, so mundane and necessary, but it is one of the most comforting, fulfilling and anchoring moments of my day. Chopping, kneading, stirring, sautéing. I love the smells, the feel of the earthy vegetables, the rhythm of dicing and slicing, the sense of accomplishment, the finished product and most of all: the gift of serving it to people that I love. I used to sit in the kitchen with my mom and grandma and be “the helper.” My grandma made the most amazing stovetop icing for cakes and I would help stir. 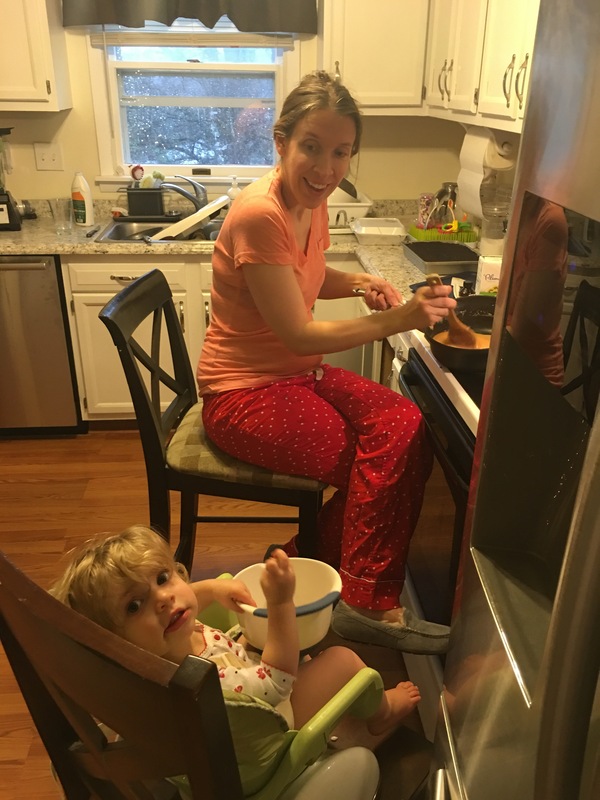 Now my toddler is “the helper.” Since she was a baby, I propped her up in the high chair while I imitated Julia Child and I gave her a play-by-play cooking show. She squealed with delight and enjoyed getting to participate, as she still does today. Inevitably there are spills to clean, eggshells to fish out of the mixing bowl and other mishaps along the way. Baking with a toddler is not a tidy process, nor does it yield picture-perfect presentation. The floor looks like snow dust from flour scattered about and sauces are splattered on the countertops and cabinets. However, passing down recipes and memories, making messes and laughing with her in the kitchen is the most nourishing activity for us all. The grass is certainly not greener from any perspective, but there’s beauty in the simplicity of the mundane rhythm of our lives. Mix the sugar, butter and evaporated milk in a saucepan over medium high heat. Once the icing begins to boil, turn the heat to low and simmer for one hour, stirring occasionally. Remove from heat and add vanilla. When the icing is smooth and cool, spread on the cake layers. ***Note: It’s important to park a chair (or two) beside the stove and keep an eye on it (while you’re listening to Grandma’s stories) so it doesn’t burn or stick to the bottom of the pan. ***Note: This is not a healthy recipe but it makes a beautiful, luscious cake that is sure to be a crowd-pleaser. This icing works especially well with two 9-inch round cake layers that are cut in half lengthwise, yielding 4 thin layers.